Are your glutathione levels putting you at risk for Parkinson's in old age? The Parkinsons and GSH relationship will tell you what you should be doing. Typing in the search term ‘Parkinson's disease’ in the Pub Med search box, returned a very interesting result. GSH was included on the third 0f 2350 total results found at the time of the query. Rather than paraphrasing, read the Pub Med Abstract for that Article for your self. Focus on the last line. This is quite exciting. For those familiar with the benefits of GSH this is not anything new. "We proposed that GSH could protect dopaminergic neurons against DA-induced toxicity via various mechanisms. The imbalance between DA oxidation and GSH protective capacity could be a key factor contributing to PD. Strategies to use GSH analogues, GSH inducers or to control DA oxidation might work to control onset and development." New Findings: The Cause May Be Bugs? This is new for 2016. We are currently researching the connection of spirochetes and Parkinson's, Alzheimers, and ALS. There is considerable information in the medical research literature. While this information does not change the great outcomes, it provides additional information on how to treat and prevent Parkinson's disease. Whether the cause is chemical, stress or any of the other causes, one thing those with PD have in common, there seems to be a growing in numbers of the bacteria. 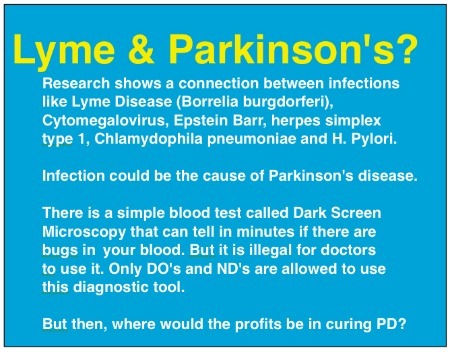 Those with out PD and other diseases do not have spirochetes or the other bacteria. According to this, boosting your glutathione can decrease your risk of Parkinson’s not to mention a number of other disease processes. "The similar loss of GSH in the nigra in Incidental Lewy body disease, thought to be an early form of PD, indicates that this is one of the earliest derangement to occur in the pre-symptomatic stages of PD. Oxidative damage to lipids, protein and DNA in the nigra of PD patients is consistent with the loss of the antioxidant functions contributed by GSH." "These multi-functional aspects to the workings of GSH in the cell would suggest that its loss perturbs many different processes and that replenishment and maintenance of GSH per se may be the best approach for preventing progressive damage from occurring." Parkinsons and GSH: What Can You Do Now? If you want to boost your glutathione there are several things you can do. Correct Dehydration Start the Water Cures Protocol. Persistent dehydration causes a disruption of the cells. The resulting dis-ease is often labeled as a disease rather than an imbalance brought on by chronic drought. Some of the other basics are discussed on this site. If you want to go beyond the basics, please contact me. Feel free to call or write. I have been looking at all the available ways if boosting the Glutathione in our bodies. There are two companies that have excellent products for just this. Which will be best for you? Well, call and I can share the pro’s and con’s of each.